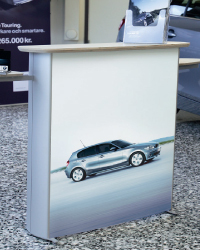 Easily assembled, stylish counter with anodised aluminium sides, white laminate top and shelf, printed magnetic graphic panel to front (733mm x 945mm - artwork required) and carry bag. Ideal companion for the Vario d400 pop-up and d2 modular systems. Add product shelves and brochure holders to the side extrusions.